Wisła Apartment is located in a close neighbourhood of Kraków’s famous theatre which bears a name Bagatela. It is one of the best locations in Kraków, just 400m from the main square, within walking distance of Wawel and Kazimierz. 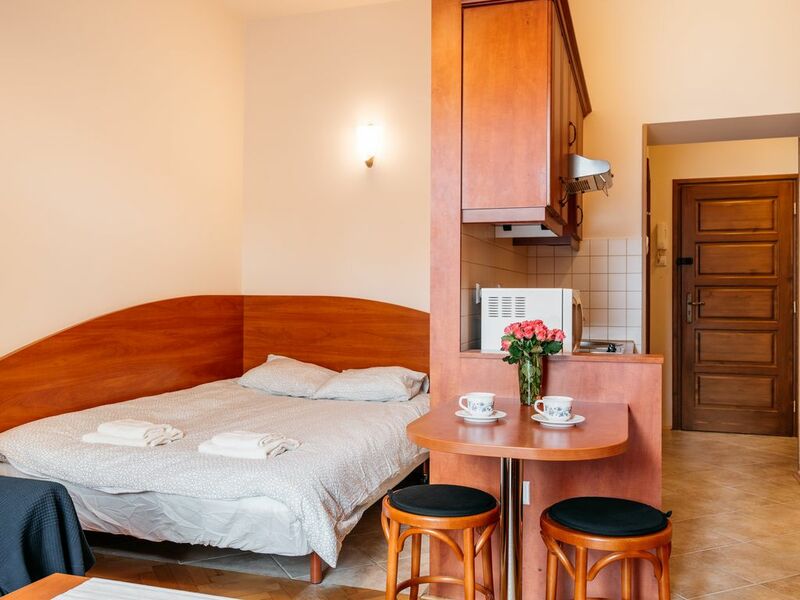 Wisła apartment is a cosy studio with double bed, well-equipped kitchenette and bathroom with a shower with all essentials needed.Wisła Apartment is located in a close neighbourhood of Kraków’s famous theatre which bears a name Bagatela. It is one of the best locations in Kraków, just 300m from the main square, within walking distance of Wawel and Kazimierz. Two restaurants and a café situated on the ground floor of the building tempt with delicious food and aromatic coffee. The Karmelicka Street is one of the main streets in Kraków. It is packed with lovely cafes, pubs and restaurants. The main square is only 400m away from the apartment and the Bagatela Theatre is situated on the other side of the street. Planty – a gourgeously looking park with stunning old trees is only 50m away from the apartment. No doubt, it is one of the best locations in Kraków!